This piece was originally published by the Seattle Times on Jan. 20, 2019. Image credit: Seattle Times. Two-thirds of Seattle residents said they would prefer to make it easier to travel without a car rather than make it easier to drive. Countywide, 57 percent agree. But that transit enthusiasm falls short, in the city and in King County, for building more bike lanes. Are impacted by traffic in their day-to-day lives. Aren’t that interested in making life easier for drivers. In other words, if it’s getting tougher out there for drivers, well, drivers can live with that — provided there are more options to get around without a car. Those are the results of a new Seattle Times poll that shows area residents hungry for more and better public-transit options, even if they’re not necessarily using transit right now. The poll was conducted last month by cellphone and landline, resulting in a sample size of 419 people in Seattle and 407 people in King County (including Seattle), with a margin of error of plus or minus 5 percent. Seventy-five percent of the respondents were homeowners, compared to about 57 percent in the county. “The irony was not lost on me,” said Katie Gunter, 38, one of the chunk of poll respondents who said both that they commute by car but would rather make it easier to travel without using a car. Gunter, a physical therapist with three young children, said she and her husband chose their Beacon Hill house in part to avoid a commute through downtown. She’s not alone in changing her behavior because of traffic: 69 percent of respondents countywide said traffic has at least some impact on their daily lives. People have responded to congestion by changing work hours, working more from home and switching jobs. And what’s to blame? The biggest culprit, according to respondents, is the number of people moving to the area, followed by poor planning by government agencies and insufficient public transportation. Only 8 percent of respondents said lack of improvements to roads and highways was the biggest cause of traffic woes. “I would love not to drive,” said Nicole Miller, 35, who nonetheless drives from her Carnation home to her job as an arborist at Seattle Children’s hospital. Miller used to commute by bus, but a recent schedule switch made that unworkable. A full two-thirds of Seattle residents said they would prefer to make it easier to travel without using a car, rather than make it easier to drive. Even among all King County residents, 73 percent of whom said they drive alone to work, 57 percent would rather make it easier for non-drivers than for drivers. And, across several different poll questions, daily commuters were more likely to favor public transit than non-commuters. “This indicates that those who use the system the most are more favorable to expanding the options,” said Stuart Elway of Seattle-based Elway Research, which conducted the poll. The results hold true for both men and women, for all age groups and for all income levels. In both King County and Seattle, no matter the gender, age or income of respondents, a majority in all subgroups would rather we work on making it easier to travel without a car than with a car. The region’s transportation agencies are working on it. Seattle Mayor Jenny Durkan, in announcing the city’s new transportation director last month, said the city would “make it easier and safer for residents to get around on foot, by bike, on transit.” She did not mention cars. When Durkan was elected in 2017, every one of the six major candidates who ran for mayor ran on a pro-transit agenda. Even the candidate viewed as most friendly to drivers, state Sen. Bob Hasegawa, proposed more bus-only lanes and making transit free throughout Seattle. We’re in the midst of a multi-decade, multibillion-dollar expansion of public transit in the Puget Sound region, stretching from Tacoma to Everett. The biggest and most prominent example of that is Sound Transit, the tri-county agency that’s operating and expanding light-rail, express-bus and commuter-rail service throughout the region. In 2016, voters approved ST3, a $54 billion ballot measure that plans to add 62 new miles of light rail, plus new express-bus routes and commuter-rail service. Most respondents think they will benefit from Sound Transit’s service expansions, which will bring light rail to Northgate in 2021, to the Eastside in 2023 and to Lynnwood in 2024. 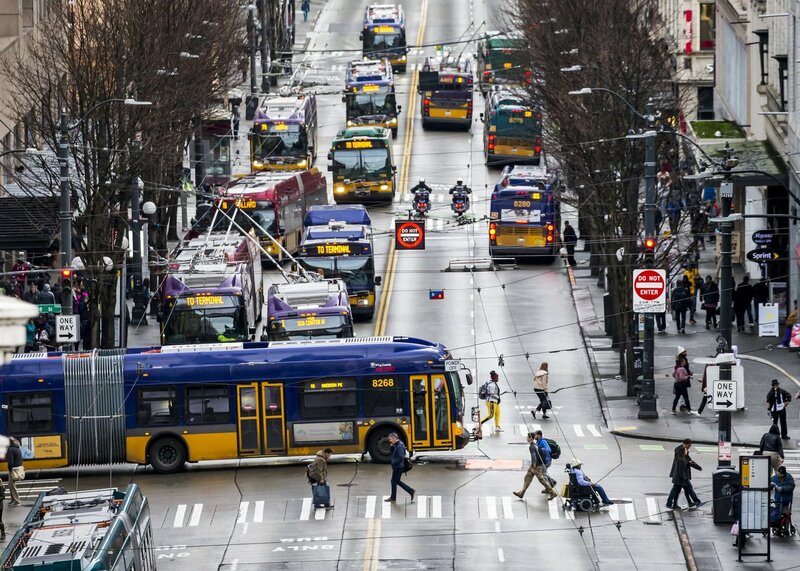 In Seattle, 63 percent of respondents anticipate benefiting from the rail and bus expansions. Countywide, 53 percent think they will benefit. Sound Transit also provides one of the starkest poll discrepancies between city and county respondents. A majority of those in Seattle — 52 percent — think the agency is spending tax money well, while only 42 percent of county respondents think the same. Mika Peart, 58, lives in Issaquah but uses light rail frequently to get around Seattle. Voters have proved consistently willing to tax themselves in smaller ways to pay for more transit service. In November 2014, Seattle residents approved a $60 car-tab fee and another 0.1 percent in sales tax to fund increased bus service in the city. The next year, Seattle voters approved the largest property tax levy in the city’s history, to fund street work, sidewalks and new bus routes. And Snohomish County voters approved what was then the state’s highest transit sales tax to fund new bus lines. In 2016, Kitsap County residents approved a sales-tax hike to fund passenger ferry service between their peninsula and downtown Seattle. You have to go back to April 2014, when King County residents shot down a bus- and roads-funding initiative, to find a time when area voters said no to more transit. A majority of both Seattle and King County respondents would like to build more bus-only lanes, to help transit riders escape congestion. Majorities also favor expanding Seattle’s downtown streetcar, a long-planned project that Mayor Jenny Durkan halted for nine months before announcing Thursday that she would like to build it. Some transit-boosting moves seem to be a bridge too far. Only 23 percent of Seattle respondents favor allowing more apartments without parking — like legislation passed last year by the Seattle City Council — to encourage transit use. Countywide, 20 percent favor the policy. And the enthusiasm for transit projects doesn’t cross over to bike lanes. Only 36 percent of King County respondents favor building more bike lanes, and in Seattle support for more bike lanes only rises to a tepid 40 percent. “I just don’t think our geography is right for that,” said Tamie Kellogg, 59, of Madrona, citing Seattle’s hills and relatively narrow streets. For all the thinking and work going into transportation projects in the region — not to mention nearly $5 billion a year of government spending countywide — most people don’t expect that things are going to get better. Only 19 percent of county respondents think it will be easier to travel around the region 10 years from now.